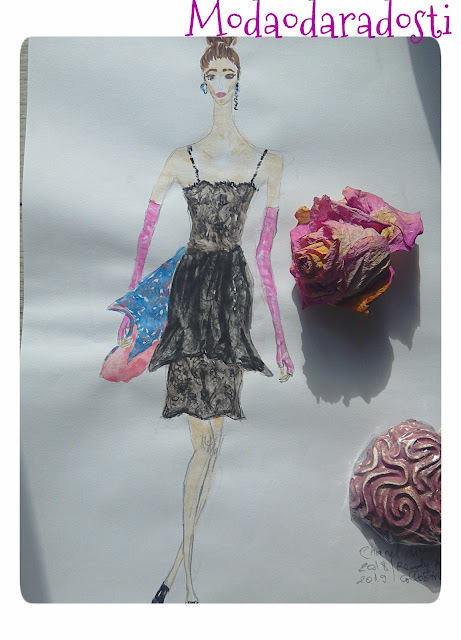 Time for another fashion illustration of mine. This time I illustrated by a catwalk look. As I told you, recently I finally got the change to catch up with some of the collections I wanted to see. 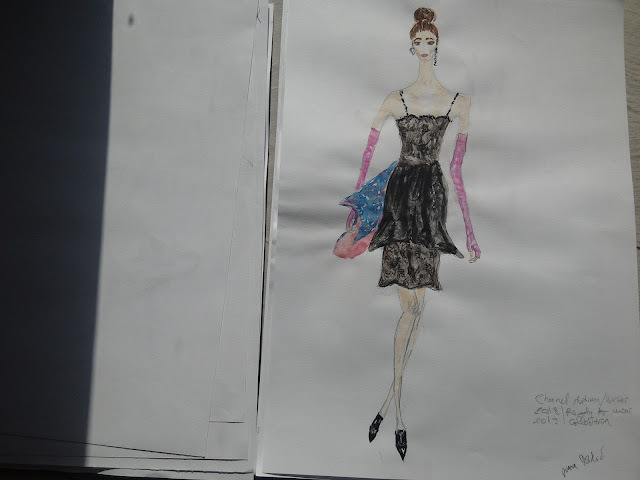 Last Saturday I have spent an entire day watching fashion shows and illustrating looks that caught my eye the most. Now, it's time to show you some of them and why not start with this one? This look was worn by Kaia Gerber in Chanel Autumn/Winter 2018/2019 Ready To Wear Collection. It is a wonderful design to illustrate. The dress itself is very elegant and classical. Black lace dress is always a nice choice. The accessories for this look are very interesting, an oversize rose pink bag with a print and long gloves in a hot pink shade. Do you like it? 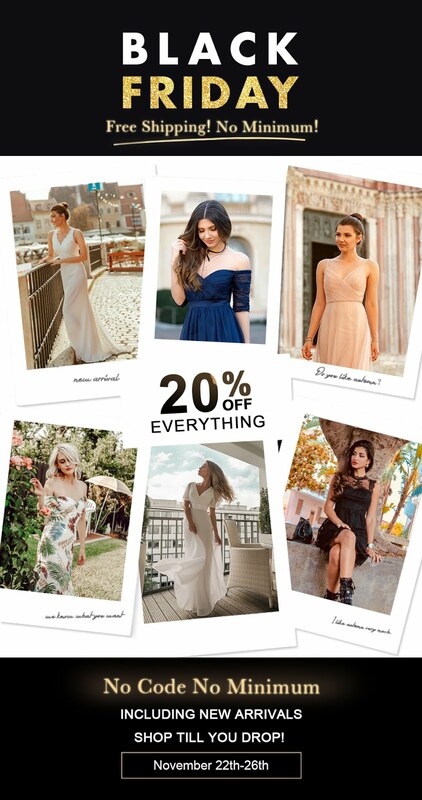 Have you had the chance to see this collection yet? If yes, how did you like it? The medium for this one is pencil and watercolour on paper. I'm not sure will I keep the outline I made with the pencil or I will delete it. I'm also considering filling in the outline with a marker or a coloured pencil in a shade of the skin. So many ideas, so little time! Maybe I will add some finishing touches to this illustration, maybe not. I'll keep you posted. I did enjoy illustrating this look. This LBD is absolutely beautiful. 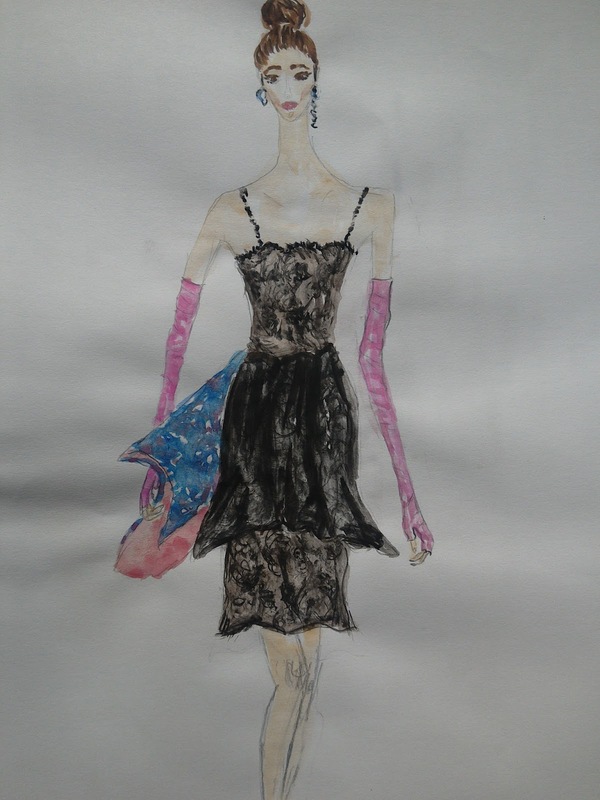 I used two layers of watercolour on the additional (peplum) lace layer of the dress because when lace is layered on lace, there is always a darkening effect. I tried to make the lace details visible, but not too detailed. 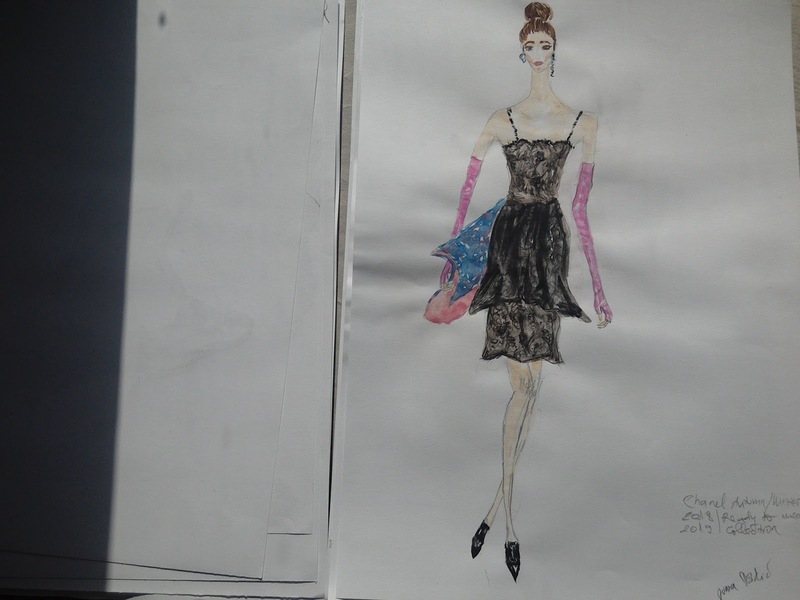 Illustrating fashion is always an interesting experience. There are so many different styles when it comes to fashion illustrations. Some are more true to body's proportions (anatomical), some are more stylized (idolized). After tackling fashion illustration for a few years I seem to have developed a preference for elongated necks and legs. Maybe I could even call it my style. Thank you for reading and have a lovely day! thank you so much, it means a lot to me!!!!!!!! I totally love this artwork for many reasons: for the way you combined real flowers with the drawing and because I totally admire Kaia and how she's ruling the fashion world, by the way Chanel catwalks are always full of details and I would say this brand is the one that still amaze all of us with their venues and set ups! I need to point out that you did a great job with the texture of the dress, I can really see the folds, the creases and the transparency of the dress! NICE WORK! you always give me such amazing feedback Pablo, I'm always grateful. I loved that show! Your illustrations are so beautiful Ivana! I've been loving Chanel lately. thank you Kim, me too! Wow, curato nei minimi particolari, hai fatto venir fuori tutti i dettagli... sei troppo brava Ivana! I'm really loving these gloves a well, I think that bright accessories were a great way to spice up their classical Chanel chic. You featured and illustrated Kaia! She's such a beauty and looks just like her mum! Sei stata davvero brava, Ivana! rendere la trasparenza ed il motivo del pizzo non è affatto semplice, ma tu ci sei riuscita benissimo! 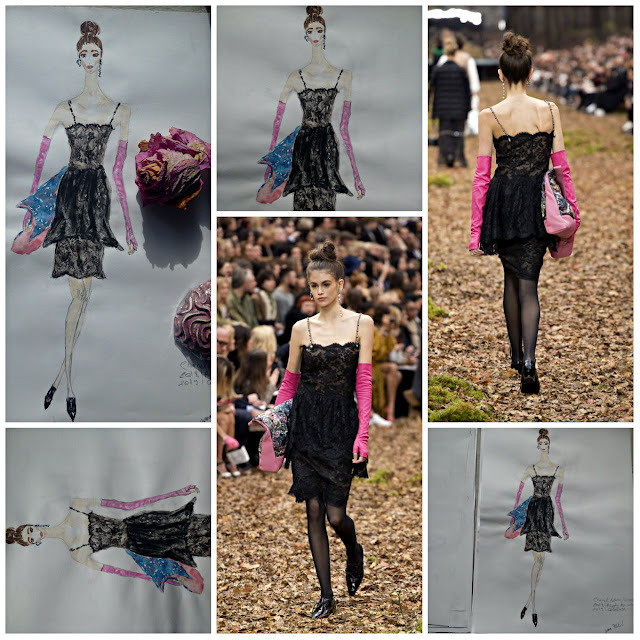 You did a wonderful job illustrating this lace black dress that Kaia wore. The pink gloves are a nice touch! Chanel is a brand that never disappoints and always impresses on the runway for fashion week. You did a fantastic job! wooow amazing :D loved all details! Lovely illustrations indeed, thanks for sharing! 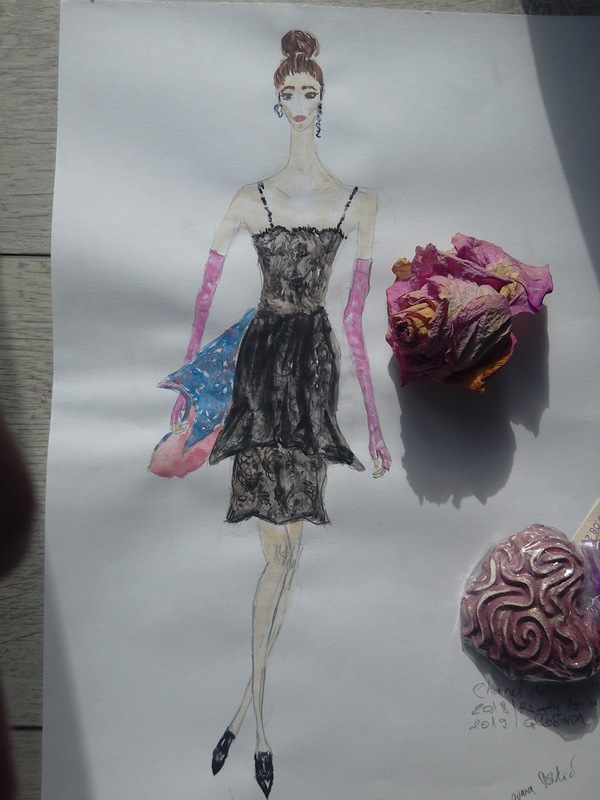 You captured the lace superbly! Amazing! One of my favorite Illustrations, great Work! laces dresses - so wonderful. i like to wear dresses like this. your painting is another beauty.